I asked the delightful and deeply knowledgeable Nancy Revy, CEO and co-founder of the dream-inducing vintage jewelry site Beladora to answer three questions about buying vintage jewelry. Nancy's detailed, forthright answers show why she's earned the trust (not to mention repeat purchases) of women around the world. All examples are Beladora pieces. 1. What should a woman consider when buying vintage jewelry besides "does it look good on me"? Fine jewelry, like many other luxury goods, have an immediate devaluation as soon as they are purchased at full retail price. As soon as you purchase a Mercedes and then drive it away from the Mercedes dealer, the value of the car goes down. The same goes for fine jewelry. As soon as you buy a piece of jewelry from Tiffany&Co. or another retail jeweler, the value of the item goes down. So, unless the jewelry is extremely rare or in demand, the advantages of buying pre-owned items is that the initial devaluation has already taken place and the price should reflect this. Jewelry styles, like clothing designs, are always changing. One year tiny, delicate micropavé jewelry is in style, and another year, rose gold jewelry is in every jewelry counter. If a woman is looking for a particular jewelry style that suits her unique look, it might not readily be available in retail stores. If this is the case, the items would likely be available in the secondary market, with estate jewelers. For example, I like to wear big bold yellow gold jewelry because it works with my style, not to mention that I look ridiculous in small delicate jewelry because of my age and my size. Few jewelers are making this type of jewelry now because the cost is so high due to gold prices. So the best place for me to find a big gold bracelet or pendant that I can actually afford is with an estate jeweler. 2. What materials, styles or eras currently represent good value, and inversely, which are pricey? Like with any other consumer good, supply and demand affects jewelry prices. Edwardian, Art Nouveau, and Art Deco jewelry is always in demand, as is signed jewelry, especially by Van Cleef&Arpel, Harry Winston, Graf and Cartier. Jewelry by specific designers such as Boivan, Belperron, Cipullo, Marchak, LaCloche, Fouquet, Verdura and Flato (the old stuff, not the new) is in demand because the supplies are so limited. All of the above sell at premium prices. 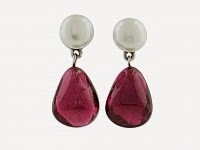 In addition, natural pearl jewelry has become highly collectible and the prices have gone up exponentially. In my opinion, the best values can be found, due to relatively large supplies and lower demand, in unsigned jewelry, especially from the Retro, Mid-century and Modern periods. 3. What Beladora wisdom might you share with a woman just beginning to invest in 'real' jewelry, but apprehensive? I am 100% against buying costume jewelry for personal reasons. Virtually every piece of costume jewelry that I have ever purchased has fallen apart and it annoys me to waste money in this way. I broke my own rule of not buying costume jewelry last September when I went on my honeymoon to Italy. I knew that I would be staying in nice hotels and dining in nice restaurants and I wanted to wear some jewelry that I didn't have to worry about. Some of the costume pieces that I bought fell apart even before I unpacked in Rome! Other items fell apart or lost pieces while I was wearing them. Looking back, I should have taken my own fine jewelry on the trip or taken no jewelry at all. Fine jewelry is meant to be durable. With normal use, it should last for decades if not longer. Even a basic gold wedding band should last a lifetime. I can't afford to buy trendy clothes, accessories or jewelry. When I invest in something I need to be able to wear it for a long time. I have Hermès scarves from the 1970s that I still wear; I have Chanel jackets from the 1980s that are more chic than what I can find today at Chanel. I have lizard skin Gucci handbags from the 1990s that I still carry. My jewelry is the same. I invest in classic pieces so that I can wear them for years to come. My everyday capsule jewelry wardrobe, aside from my wedding jewelry, includes a yellow gold watch (or two), a sporty two-tone gold and stainless watch, a good yellow gold bracelet and some simple yellow gold earrings. My dressy jewelry includes a white gold watch with diamonds, Mid-century diamond earrings in platinum and a Mid-century diamond brooch in platinum. My next investment will be an important diamond bracelet in platinum. And of course I have cultured Akoya pearl necklaces, bracelets and earrings, but hopefully I will soon be able to step up to a good South Sea strand and earrings. My everyday capsule jewelry wardrobe, aside from my wedding jewelry, includes a yellow gold watch (or two), a sporty two tone stainless and gold watch, a good yellow gold bracelet, and some simple yellow gold earrings. So I approach buying jewelry in the same way that I approach buying clothes: I invest in fewer but better quality classic pieces. If a woman's style is buying the latest trendy whatever and then discarding it the next season, estate jewelry probably isn't the right investment for her. As someone who has long enjoyed vintage jewelry, I appreciate Nancy's expertise and thank her warmly for her advice. From a sweet silver charm to a lavish diamond necklace, fine vintage jewelry is excellent value (given a reputable vendor like Beladora) and holds a mystique unmatched by most current pieces. And you need not spend more than many costume pieces; this Edwardian (ca. 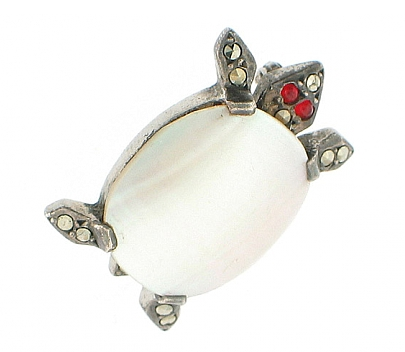 1900) turtle pin, $295, costs less than a costume brooch I recently noticed in a department store, with immeasurably more character. Such workmanship and quality are hard to find now. That's why it's always my first stop when shopping for a heart-racing delight. Wonderful interview with Nancy!! She is SO knowledgeable and I always learn something from her. I could spend hours each day just perusing Beladora. Yes, great interview and good points. Beladora's site is a reliable source of endorphins, i.e. the chemicals of pleasure, every visit:). Great interview and wonderful points about value for money and quality. Nancy makes some really good points in this interview. I have never thought about selling any if my jewelry and am surprised to learn that it actually devalues. I must watch too many of the Antiques Road Shows where they appraise vintage pieces at a premium. A chunky gold bracelet would be fun...off to check out what Beladora is showing this week! pseu: I in fact have been "lost" on that site for hours! LPC: Nancy and I share a particular affection for antique bugs, bees and other such pins or brooches, but she is equally enthusiastic about retro and modern- and I trust her. Mardel: I can't believe the crap some jewelers hand customers about value; it's outrageous. I have shot a few "The Look" as I heard them BSing customers- and then left. hostess: Yes, it does considerably- with the exceptions of certain master jewelers and prestige houses, such as those Nancy named, or jewelry with proven provenance such as "owned by Garbo". Like art, there is only a small subset of the vast market that is a solid investment. Now that you are retired you could spend some engrossing hours learning more via auctions, shops, museums, reading. Another wonderful teaching post, thank you for interviewing Nancy and sharing with us. I learned some basics of the business while working in the repair department at Birks main Toronto store for a couple of years. Fascinating how it all works behind the scenes. Wonderful advice. Thank you for asking these questions. Costume jewellery from the 40s and 50s is also very collectible and much of it is extremely well made. Marilyn Monroe's jewellery for e.g. was almost 100% costume. 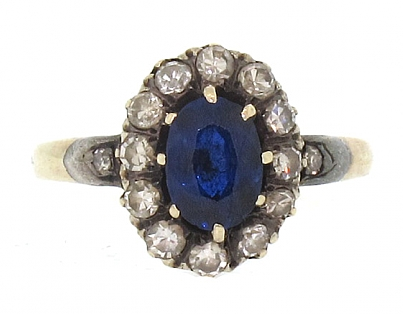 At the time some of the top designers were people from the fine jewellery field and registered the stuff with patents. Now you may have problems getting rhinestones reset if they lose their luster through age and such because in Canada there are almost no places that do repairs. It would be a good business for someone to setup. I agree with Anon 8:58 that older costume is both collectible and rather desireable (think also of earlier Bakelite. Or Victorian paste. Yum). I think what Nancy was referring to was the ton of schlock being served up by J Crew, Kate Spade, and others. Pricey and sheer garbage. As for estate and antique jewelry, I've been addicted since college, and love to see the workmanship as much as wishing to own it. I do like the delicate pieces out now (Grace Lee is a favorite), but like all jewelry, it should be bought because you love it, not because you think it's an investment (rarely) or it's "in" (ugh). Anon@8:58: It is, and is priced accordingly- unless you stumble on a find in a garage sale, or the like. Even if well made, replacing a stone or finding is a challenge- no matter where you live. Some of the techniques used on costume were the same as in fine jewelry but now, even with three-figure price tags, most costume is made with glued-in stones and other cost-cutting effects. Gretchen: The only way to buy that mass-market, trendy costume is on sale or as pre-owned, knowing it may have a short shelf life. Great post, thanks Duchesse. I had a good look around Beladora a wee while ago and yearned over all sorts of pieces. I do LOVE estate jewellery for the reasons Nancy mentions i.e. you get so much more bang for your buck, you get styles that you can't find otherwise. Two more points she didn't make is that the quality of the stones and the quality of the worksmanship are often so much better in estate pieces. I cannot be doing with bright fake-looking heat treated stones like you see in lots of modern jewellery. I'm also disappointed that most jewelers just pop stones in a few pre-made basic designs. They all look the same and the only difference is how much you spent to get your carats. Boring! Eleanorjane, you are so right about the craftsmanship. I worked in an estate jewelry shop for awhile and loved just to examine the pieces to see how artful they were. The way an Old Mine diamond throws light is infinitely more beautiful than a modern brilliant - designed to look best in candlelight, they are the most romantic, fire-like stones. I hope more people will explore vintage jewelry and give these pieces a new life. It's the ultimate recycling project. Agreed...love Beladora's site and thank you for introducing me to them. I have requested info on some pieces, haven't purchased anything yet....but hope to do so shortly.